GM Stays At The Top As U.S. Car Sales Surge In July : The Two-Way An analyst says GM might have benefited from the safety recalls that brought customers back to its dealerships. Many automakers saw strong gains compared to last year. 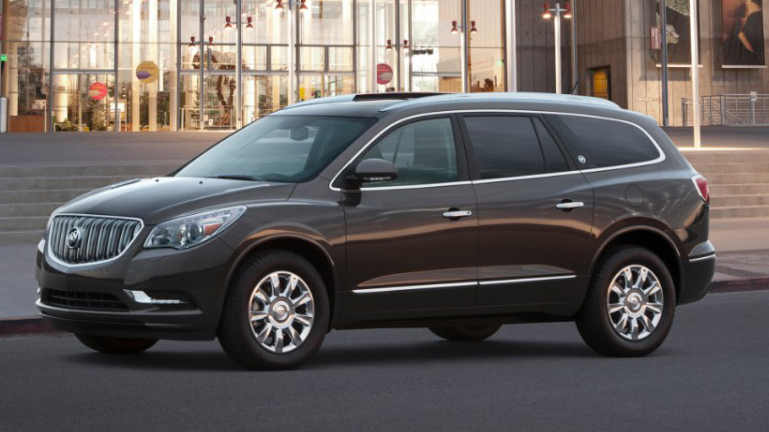 Sales of GM's cars slid by 3.8 percent from July 1013, but its light trucks and SUVs, like this Buick Enclave, more than made up for it, spiking 17.5 percent. Sales incentives helped U.S. auto sales rise in July, as major auto companies reported selling more than 120,000 more vehicles than the same month last year. GM retained its spot as the U.S. sales leader. Sales of passenger cars rose by nearly 5 percent this July compared to last year, with sales of light trucks even higher, at 13.4 percent, according to data released Friday by research firm Autodata Corp.
GM sold 256,160 vehicles last month, beating Toyota's 215,802 and Ford's 211,467. "Toyota, Ford, Nissan and Chrysler all saw their sales go up by double digits. And despite troubles at General Motors, sales at the Detroit car giant were up 9 percent over the same time last year. Jessica Caldwell is a senior analyst at Edmunds.com. She says GM's recent spate of recalls may be helping it. "Meanwhile this month, victims of the GM ignition switch defect can begin filing claims for compensation. The company has set aside $400 million to cover the cost." Sales of GM's cars slid by 3.8 percent from July 1013, but its light trucks and SUVs more than made up for it, spiking 17.5 percent, according to Autodata. In the calendar year to date, the company has sold 3.5 percent more cars. Other automakers struggled. Some of the steepest sales declines were at Volvo, which sold 17 percent fewer vehicles compared to July of 2013, and Volkswagen, where sales were down 7.5 percent. Honda also slumped, with a drop of nearly 4 percent from last July.